The body proportions of animals are affected by a number of considerations, probably the most important of which are the ratios of size to mass. If two individuals were to have exactly the same shape, but one was twice as long as the other, all other linear dimensions would be double those of the smaller individual. The surface area would, however, be the square of the surface area of the smaller individual, while its mass would be cubed. Thus, if a reptile 3 m in length with a surface area of 4 m2 weighed 150 kg, a similarly shaped individual 6 m long would have a surface area of 16 m2 and would weigh 3.375 tonnes. This huge increase in mass relative to linear dimensions invokes one of the many problems involved in scaling (Schmidt-Nielsen 1984; Alexander 1997b). Some consequences of size are not closely related to the laws of physics. For instance, the effectiveness of an eye depends upon is absolute size, not on the size of its possessor. Consequently, larger animals tend to have smaller eyes relatively to their body mass. The same applies to brains. There is indeed a rough correlation between the size of its brain and the intelligence of an animal. Intelligence, however, is proportional more to the surface area of the brain than to its weight, so that mere percentage brain-weight is no criterion of intelligence. The dinosaurs may not have been quite so slow, unresponsive and silly as is sometimes thought! (see Buchholtz 1997). or they must stand and walk in such a way as to minimise stresses, or both. This problem does not arise, of course, in the case of aquatic animals whose weight is supported by buoyancy (Alexander 1971). The ability of bone to resist compression, the relationship between mass and surface area, as well as various physiological problems, including thermal ones (Sect. 7.5), also affect larger animals (Cloudsley-Thompson 1977). Many Mesozoic reptiles were extremely large and heavy. The Diplodocidae ('double beams'), for example, were enormous plant eaters and included some of the longest of all dinosaurs. 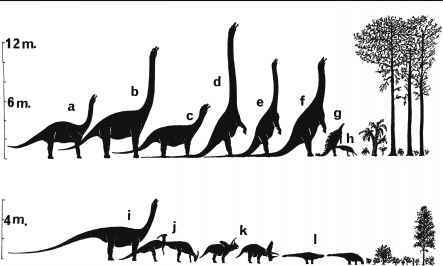 Among the best-known genera are Apatosaurus (= Brontosaurus), Atlantosaurus, Brachiosaurus, Diplodocus (Fig. 66), and Seis-mosaurus the 'earth shaker' (Gillette 1994). Despite the fact that they were relatively lightly built - their backbones contained deep weight-reducing hollows -they were, nevertheless, extremely heavy. They maintained an erect posture and had weight-bearing or graviportal limbs, as do elephants and rhinoceroses today. from the tensile strength of bone that they would just be broken at these places by forces of 20 tonnes. If the muscles were strong enough, the animal could have taken steps at up to about 45° to the vertical with the femur almost horizontal. So the bones were quite strong enough, provided that excessively long steps were not taken and the dinosaur did not stumble. Fossil footprints show that the steps taken were 2.4 m in length, which is quite modest for an animal with hind legs more than 3 m long. No doubt larger genera would have taken relatively smaller steps. The larger they were, the less agile they must have been,just as elephants are less agile than smaller mammals (Alexander 1971). saurus excelsus (ca. 35 tonnes) must have been terrestrial (Bird 1944). 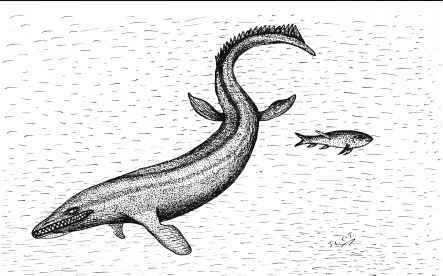 Moreover, to have used their long necks as snorkels so that they could breathe while standing in deep water would have been a difficult process. In the case of Diplodocus, the lungs might have been 6 m below the surface. To have expanded its lungs against the pressure of water at this depth would have needed enormous chest muscles. It seems probable, therefore, that the largest of the sauropods would have kept clear of marshy places where they might have got bogged down (Alexander 1985,1989). Another of the reasons why the larger dinosaurs - such as Brachiosaurus brancai (Fig. 68), which may have weighed about 80 tonnes - were thought to have been aquatic is that their external nares were situated high on the skull, extending posteriorly to just in front of the orbit. This would have enabled their possessors to breathe with the body entirely submerged, as crocodiles do. However, the living reptiles with a narial structure most closely resembling that of the apatosaurs are terrestrial - ground iguanas (Cyclura spp.) and desert monitors (Varanus griseus). Again, in most truly aquatic reptiles - crocodilians, phytosaurs (Fig. 29), Champsosaurus (Fig. 30), and so on - the tail is a powerful propulsive organ. In contrast, the tail of the apatosaurs was slender, ending in a whiplash like that of many terrestrial lizards, past and present. erally also argues for terrestrial habits (Fig. 69). For these and other reasons, it is now accepted that the deep chest, long limbs, and long necks of all the sauropod dinosaurs were adaptations for browsing on land, and were not related to an amphibious or aquatic existence (Fig. 70; Bakker 1971b). For estimating sizes and size limits, the weights of dinosaurs are more important than are their heights or lengths. Unfortunately, there is considerable uncertainty about calculating the masses of dinosaurs. For example, E.H. Colbert (1962a) estimated the weight of B. brancai as 78 tonnes - using the model method. In 1989, Alexander's estimate was 47 tonnes, but the previous year G.S. Paul had calculated that it was only 32 tonnes. The reason for these differences is that the various authors based their calculations on different fossil individuals. Unmounted limb bones of an Apatosaurus from Tanzania are about 30% larger than those on which Colbert based his calculations! Furthermore, some authors used models in which the dinosaur represented was a bulky animal; others used skinny models. To add to the uncertainty, the densities of dinosaurs are not known in the first place. It also has to be assumed that dinosaur bone was about as strong as the bones of modern birds and mammals. This is probably the case, but we cannot know for certain (Alexander 1989,1997a). Beverly Halstead pointed out in a review of Bakker's, The Dinosaur Heresies (1987), the evolution of dinosaur stance and gait was worked out by Alan Charig as long ago as 1965, but is presented without acknowledgement. 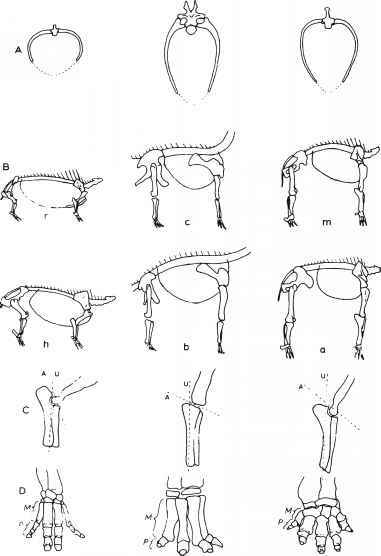 In order to test the validity of Bakker's claims, Alexander (1985) tried to estimate the positions of the centres of gravity of sauropods and some other dinosaurs to see if it would have been possible for them to have reared up on their hind legs. 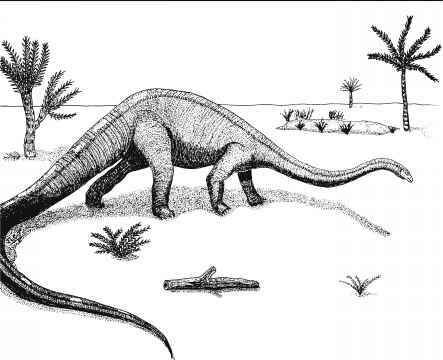 He argued that the densities of dinosaurs were probably nearer to 1,000 kg m-3 than to 900 kg m-3, as Colbert (1962a) had assumed, and he concluded that both Diplodocus (Fig. 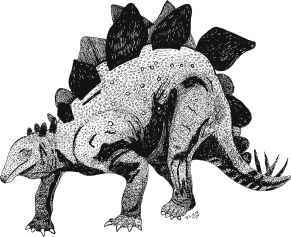 66) and Stegosaurus (Fig. 71) supported about 80% of their weight on their hind feet, and only about 20% on their forefeet. They would therefore both have been capable of rearing up on their hind legs. The trunk of Triceratops (Fig. 72) probably tended to sag and would have required tension in the hypaxial muscles to prevent this. 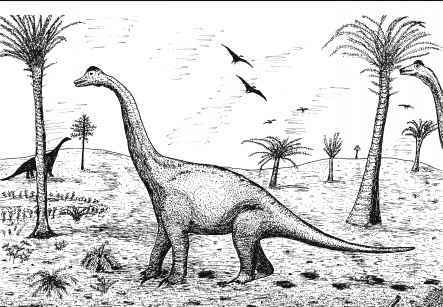 Diplodocus, on the other hand, had no tendency to sag because of the counterbalancing weight of the neck and tail. The neck was presumably supported by a strong nuchal ligament running through the forked neural spines of the cervical and dorsal vertebrae. The leg bones of Apatosaurus were probably strong enough to have permitted the degree of agility shown by modern elephants. 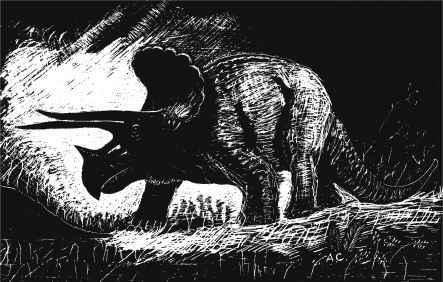 Those of Diplodocus were too weak for running while those of Triceratops were strong enough for even greater agility than that of elephants. The pressures on the soles of the feet of large biped dinosaurs were about the same as those of cattle, but higher pressures acted on the feet of sauropods. have been necessary to maintain an adequate supply of blood to the brain. Clearly, the cardiovascular pressures in sauropods would have been enormous. Hohnke (1973) pointed out that a specimen of Brachiosaurus (Fig. 68) in the Berlin Museum showed a vertical blood column of about 6.5 m above the heart. This is about twice that of a giraffe, and would have required a ventricular pressure of over 500 mm of mercury (Hg) just to support the column! (Alexander 1997a). Alternatively, the apatosaurs might not have raised their heads high or, if they did, they might have endured a temporary cessation of blood flow to the brain (Seymour 1976). How to calculate weight of a dinosaurs from its footprint?